Nutiva Organic Virgin Coconut Oil with its light taste, pleasant aroma and pure white colour is a huge contrast to the industrialised coconut oil, with its bland taste, faint aroma and off-white colour. 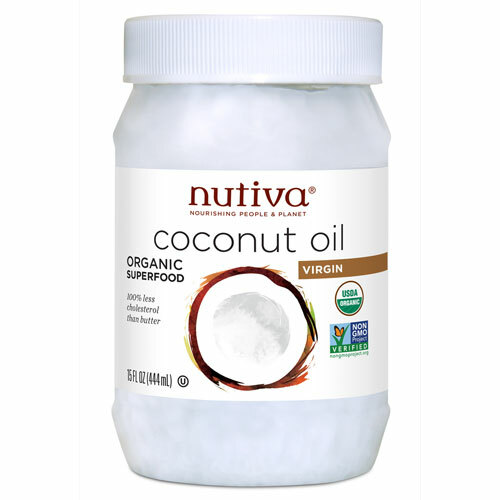 Nutiva`s Virgin Coconut Oil is ideal for baking or as a butter replacement. Coconut oil is also excellent for body and hair care. Refrigeration is not required. Coconut oil is solid at room temperature and melts at 76 degrees. Below are reviews of Nutiva Organic Virgin Coconut Oil - 444ml by bodykind customers. If you have tried this product we'd love to hear what you think so please leave a review. 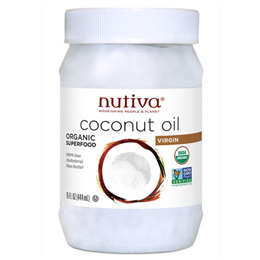 NUTIVA is a high quality soft, pure white organic virgin coconut oil. I keep the large jar in the kitchen and scoop out some into a small jar to keep on the bathroom shelf for cosmetic purposes. Minute quantities are perfect for dry skin and hair. This is a brilliant product for skin conditions such as athletes foot and also can be drunk for digestive improvements.